Fall is most definitely in the air. The trees are starting to change. Pumpkin patches, apple cider, and the anticipation of Halloween is among us. As a pediatric dentist, I am often asked if Halloween is my least favorite time of year. How could a mother and a pediatric dentist not love the excitement and joy the time brings to my patients and my own children? I love to talk to my patients about their costumes. I enjoy hearing of the creativity of parents and children alike. I love to hear a 4 year old explain her combination costume because she cannot choose just one costume so she becomes a mix of several. I think of Halloween as another time where children can use their imaginations and become anything for a day or in the case of my children they are in character several months before and after the event. This time of year offers so many opportunities to join art and nature. The beautiful leaves and pumpkins lend themselves to so many wonderful projects. When we think of Halloween we often think of candy, but the focus can be on so much more. The preschool my son attends only allows parents to bring non-food items for the Halloween party. I promise I did not ask the school to adopt this policy, but I’m sure glad they did! The “treats” we provide are stickers, pencils, bubbles, play dough, finger puppets, tattoos, bouncy balls, spider rings, mustaches, maze puzzles, stretchy skeletons, tooth brushes – you get the idea! At the end of the party, I have never heard my son or any of his friends complaining. In classrooms when snacks are encouraged there are so many creative and healthy options. A tangerine can quickly become a pumpkin when it is peeled and a piece of celery is placed on top. A banana can be cut in half and mini chocolate chips can be used as eyes and a mouth to make a ghost. A sharpie marker can be used to draw eyes and a mouth on the wrapper of a string cheese to make a ghost as well. A clear cup can be filled with green grapes and Frankenstein’s face can be drawn on the cup. These are all easy, healthy options that kids will be excited about. Not only are healthy snacks better for their teeth they are better for the health of their minds and bodies. A classroom full of children consuming high amounts of sugar is not going to be a well behaved class. 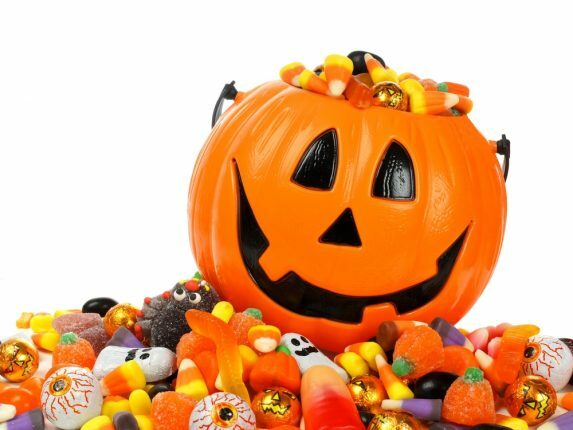 As much as we will try to avoid the candy leading up to Halloween night, it still will appear in our homes after a night of trick or treating. Some candy is better than others. Sticky, chewy candies such as caramel, taffy and tootsie rolls stay on the teeth for a longer period of time making the tooth more susceptible to decay. Hard candies and lollipops also expose the tooth to sugars for a longer time period. Sour candies are acidic and can erode the enamel. Sticky candies also can remove or loosen orthodontic appliances (braces), spacers, crowns or fillings. Halloween night, like any night, it is important to floss and brush using a fluoridated toothpaste. A cavity is not formed in one night. Our overall oral health is determined by our oral hygiene habits and diet the reaming 364 days of the year. This is why we should allow our children to enjoy the candy in moderation over a short period of time and then the candy should be removed from the home (or placed in a secret cabinet for parents with a sweet tooth). Getting rid of the candy can be a fun event as well. Many organizations around town offer a buy-back program where they will pay the child for their candy and then they will send it to our troops overseas. Your family may choose to have the giant pumpkin take the candy away at night. The Sugar Goblin is a stuffed animal and a book that comes in exchange for the candy or a similar idea, The Switch Witch takes the candy for her naughty cat and leaves a toy. The candy can also be used in an art project or to make a gingerbread house. There are many creative ways to get the candy out in a reasonable time frame and not spoil the fun! I hope you enjoy the company of your friends and family more than the candy! Happy Halloween!